Less than one month remains in the regular season, but the middle of the conference standings are as muddled as ever. Eight teams have between two and five Big Ten wins, while Purdue has broken away as the clear favorite at the top. Illinois finally earned its first Big Ten win after the season by downing the Hoosiers in Champaign. Freshman guard Trent Frazier was sensational, scoring 19 points and dishing three assists. The Illini have a chance to make it two in a row when they host Rutgers tomorrow. The Scarlet Knights’ offense isn’t just bad, it’s abysmal. 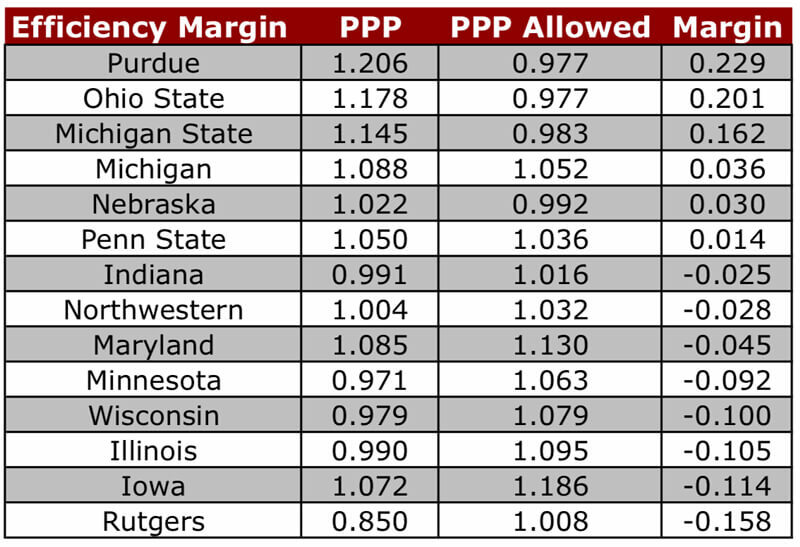 Their 0.85 PPP in conference play is miles behind every other Big Ten team. In a Saturday loss at Penn State, Rutgers could only muster a putrid 43 points on 0.63 PPP. Behind 17 points from freshman Luka Garza, the Hawkeyes throttled a depleted Wisconsin team. On Saturday, Iowa had a chance to top the Cornhuskers in Lincoln, but a brutal second-half defensive effort where they allowed 50-points did them in. Has Wisconsin hit rock bottom? The Badgers had a disastrous week, dropping road games to Iowa and Michigan State by a combined 33 points. Greg Gard’s club now has an opportunity to right the ship with a two-game homestand, but pulling off wins against Nebraska and Northwestern won’t be easy. Even with sophomore Amir Coffey back into the fold, the Golden Gophers steep fall down the Big Ten standings hasn’t ceased. Hosting Northwestern on Tuesday, Minnesota’s blew a double-digit lead due to an inept second-half offensive showing. If Minnesota can’t win at least one of their two road games this week (Iowa on Tuesday, Michigan on Saturday), any possibility of a second straight NCAA tournament appearance will go out the window. Faced with a three-game week, Indiana showed fight, but only pulled out a victory against Maryland. 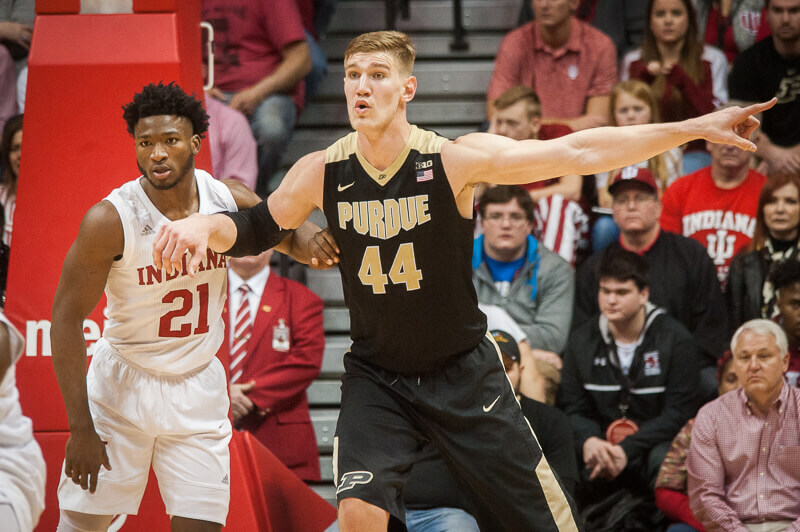 Late game turnovers proved costly for the Hoosiers in close defeats at Illinois and to Purdue. With Collin Hartman (lower leg injury) out for at least two more games, Indiana’s already-shallow frontcourt will face staunch tests against Ohio State and Michigan State. The Wildcats appear to have found some rhythm, but it may be too late for a postseason push. It’s almost February, and Northwestern still has yet to record a KenPom Top-50 victory. They’ll have five shots at a resume-building wins in the regular season’s final month, as they have February dates with Michigan (twice), Maryland (twice) and Michigan State. A bubble team not long ago, the Terrapins have now lost four of their last five. Sophomore Anthony Cowan, relied on by Mark Turgeon for his offensive firepower, has struggled of late, shooting just 42 percent from the floor and averaging 4.5 turnovers over the last four contests. Josh Reaves has returned from suspension and the Nittany Lions are rolling. Penn State’s swiss army knife provided major contributions off the bench in triumphs over Ohio State and Rutgers, reaching double-figures scoring in each and recording four steals against the Scarlet Knights. But as good as Reaves has been, it was sophomore Tony Carr’s heroics that ended the Buckeyes’ undefeated Big Ten campaign. It was another successful week for Nebraska, as they went 2-1, with the only loss coming to Ohio State on the road. Senior big man Isaac Copeland was sensational in the two wins over Rutgers and Iowa, totaling 46 points and nailing 8-of-10 of his three-point attempts. Once again, Michigan was unable to shock the Boilermakers, falling by four points in West Lafayette despite 26 points from senior Muhammad-Ali Abdur-Rakhman. The Wolverines have a two-game homestand upcoming, but morale in the student section may be lowered after news came down that T-Rex costumes will no longer be allowed. After an early January slump, the Spartans have recovered to win four straight, including road victories over Illinois and Maryland. But an Outside The Lines report released Friday rocked the program, and questions about Tom Izzo’s knowledge of reports of sexual assault involving Travis Walton, Adreian Payne and Keith Appling aren’t going away anytime soon. Chris Holtmann’s dream start to his first Big Ten campaign came to a dramatic end as the Buckeyes were beaten at the buzzer on Thursday by Penn State. Still, Ohio State has massively outpaced expectations and is comfortably in the NCAA tournament picture. Purdue’s senior core once again lead the Boilermakers to an undefeated week. On Sunday, Matt Painter’s team used clutch play down the stretch to quash Indiana’s upset bid. They’ve now won a program-record 17 straight games and are well on their way to a second consecutive Big Ten regular season title. Gotta love being ranked behind 3 teams ya beat. Is this a criticism of the ranking, or just a general comment? That’s the nature of rankings. It’s just mathematically impossible to be ranked ahead of everyone you beat and behind everyone to which you lose. The Hoosiers are also ranked higher than 2 teams to which they lost. Is Tom Izzo and/or the basketball staff being investigated in the Nassar problem? The entire university and some state officials are under investigation for Nassar. The basketball and football programs are under investigation for repeated alleged violent attacks against women. Whoa!!! I just saw the replay of Izzo’s press conference yesterday. I knew suspicion was centered around him and others but wasn’t sure if anything official has been released. Yeah, this may get petty ugly. Yeah, i agree that he took unnecessary grief for his comments last week, typical of our hyper sensitive society we live in. But, what I’m talking about is the investigations of violent attacks against females by football and basketball players over the last few years. I don’t know much else than that, and I’d have a hard time believing Izzo covered something up. And both those teams, unlike us, have losing records (in B1G), as do 2 of the 3 ranked ahead of us that we beat. So yeah, it seems a bit ironic. Definite error in line 383. I am on the fence about Izzo. His interviews stink of show me sympathy because I care NOW. The other head of the coin says to me….what was he supposed to say? I am not into moral victories but when making these polls it would be nice if the voter(s) watched the games. IU could have won both games this week. They didn’t but they played decent…just not good enough. Some of the teams ahead of us have been blown out! We blew out NW. Only MSU under dire circumstances(for them) has blown us out. I couldn’t tell, which is why (I thought) I kept things civil. NW and MD have more or less beaten the teams they should beat and lost to the teams they should lose to. Maryland’s loss at Indiana is easily their worst, and they won at Illinois. Indiana is more of a mixed bag. Some decent wins, but some bad losses. I can definitely understand the case for putting NW behind IU, though. Nebraska might make the tournament, who would’ve thought that.